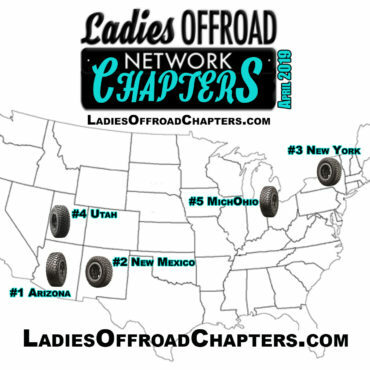 A Ladies Offroad Network Chapter is a group of likeminded women who have the passion and the drive to learn more, experience more, and share more about the Offroad community in a specific region of the World. 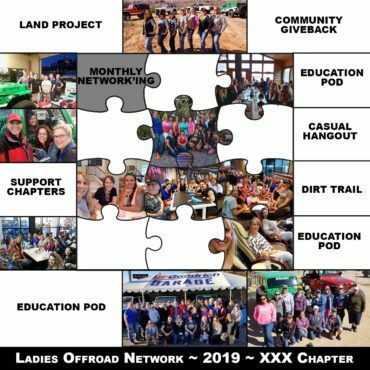 A Chapter is an extension of the National group allowing for local offroading interaction and exciting events where ladies can work together daily, monthly and yearly. All Chapter will start in the Stock Class which supports a start up phase. There is no member minimum and has a goal to complete half of the requirement list. A chapter can only maintain stock class for a total of 2 years. A Chapter will move to the Pro Class when Membership reaches 20 ladies and they have complete all requirement list the first time. There is a submission process for events to be recognized by National team before Chapters engage and release their events. Marketing tools will be created by the National team and will help the Chapter with their release. All submitted post-event write ups and photos will be posted on the website and social media. 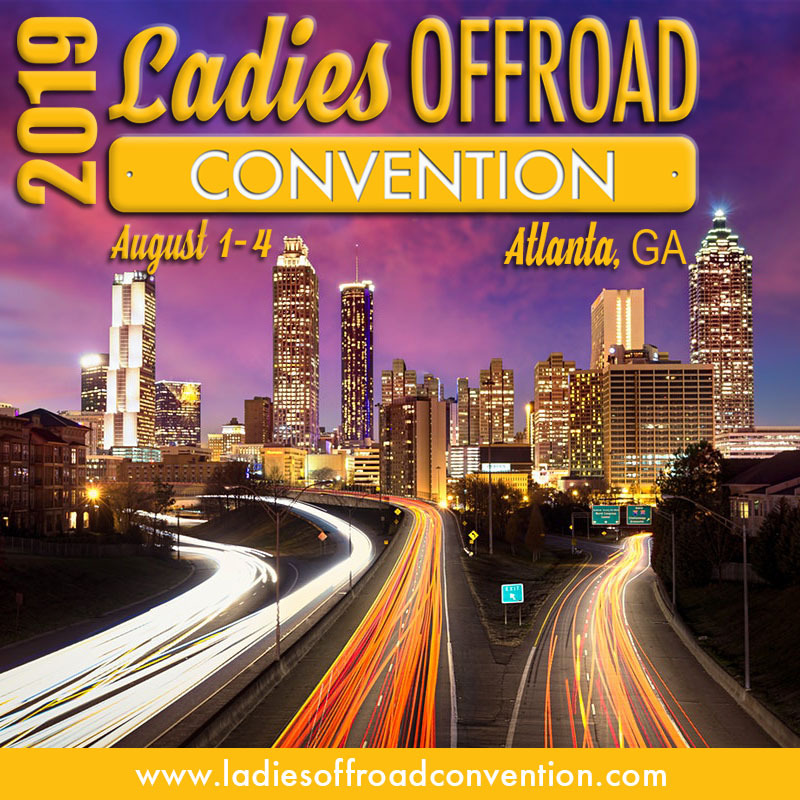 Points are earned for completing tasks, including timely post-reports, with an Awards Ceremony on the Saturday of the Ladies Offroad Convention! Monthly Network'ing Events - Chat and Plan! 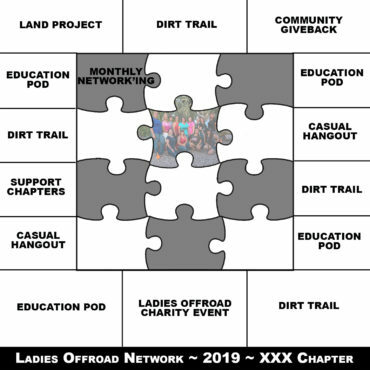 Hosted by different members monthly, this is your casual after-work evening to chat, plan and welcome new ladies into Ladies Offroad Network. Quarterly Education Pod - Learn, Learn and Learn More! Charlene will be developing Education Pods that you can bring to your Chapter. Designed to be 2-4 hours of hands-on activities, your group can choose when to meet and go through the program. Yearly Land Project - Take care of our Trails! Collectively decide on a land project that your Chapter can complete that makes sense to supporting your local area. Can be a trash cleanup, trail maintenance day, building a trail and so many other options. As each of the events are completed and the post-event recaps and pictures are submitted your chapters Puzzle pieces will be filled in. Example of the Puzzle at the End of an Amazing and Hugely Successful Year!! 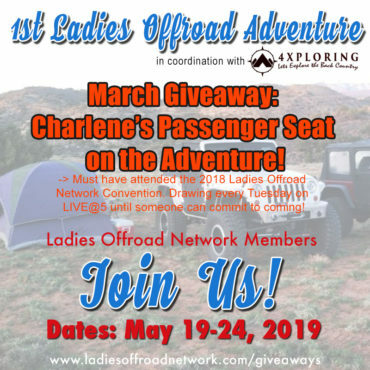 A Ladies Offroad Network Chapter is composed of a three person Leadership team and an amazing Team of Ladies that are empowered to participate and take leadership roles. 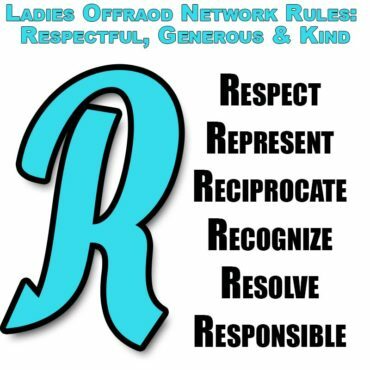 Ladies must be either a National or Chapter Member to participate. The Chapter Liaison is available to assist all Chapter leaders and members be successful, overcome challenges and bridge the National and Chapter teams. As of April 2019, Jaime Bengston is the Chapter Liaison. The three person Leadership team is responsible for leading the Local team of Network members and communicating to the National team. It is composed of a Driver, Co-Driver and Spotter. Assist in preparation for Network'ing and events. Be a "cheerleader" for your chapter and encourage the exchange of ideas and communication among members in person and through social media. Engage on social media and in the members only area of LON. Make sure that all documentation is sent to LON National about events and activities. Maintain all documentation of events, members, and activities. Assist Co-Driver in planning and implementing strategies to attract members. 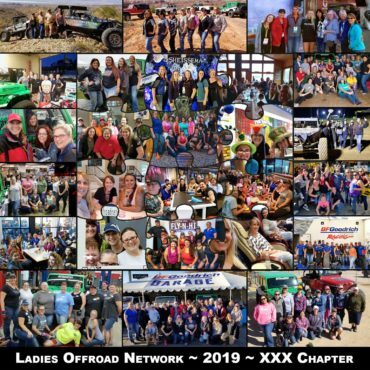 Having the correct leadership team in place is essential for respecting Ladies Offroad Network Vision, Goals and Future. It is important that ALL that are interested take an opportunity during this phase! Don't discredit yourself if you see someone else put their name on the list. Encourage each other and have discussions on what is best. All being regionally local may not be the best situation for the bigger group, having you spread out may host more opportunities. All leadership communication happens through Basecamp so no one is required to be at "meetings"
Once submitted the application will be reviewed by Charlene, Chapter Liaison, Member Liaison, Local Assistant and Local Ringleader for final approval. Communication and Announcement of acceptance will be made within a respectful amount of time. As a leader your job is to build other leaders. As you decide that you are not going to continue to participate in the Leadership team, you will communicate with the Chapter Liaison and Charlene. You will then be encouraged to start working within your Chapter to find the next leader that will be excellent. These people will need to go through the application process similar to the above stated. Communication with the National group, all Chapter Leaders and your specific Chapter Leaders will all be hosted in Basecamp. It is an online program and app. You will be shown how to use it and will be expected to use it. This program replaces all text, emails, dropbox, google drive accounts etc. Charlene will host a Monthly Leadership call that will be planned weeks in advance. You are asked to attend the call LIVE so you can ask any questions immediately and help direct topics. Topics can range from upcoming events, to overcoming obstacles, to event production tips, and a slew of other topics that will help you be successful. There will be a Leadership Summit in Q4 of each year. Two of the Three leadership ladies are expected to attend. If two cannot, then one plus a team member. The goal will be for all Chapter Leaders to work together in a exciting high-intensity meeting space. These will be full work days to maximize your time. A simple outline is: Friday, arrive for evening activities. Saturday, FULL day of seminars, workshops, and networking. Sunday, present your following year plan to the group being able to leave in the afternoon.